Urban Decay Naked palette is fairly similar to Urban Decay Naked 2 eye shadow palette, but the only obvious dupe is Half Baked which is a double-up in both palettes. The rest are slightly different, some hugely – some close enough that only a diehard eye shadow fanatic would notice the difference. As with the original Naked Palette w/ Brush, there are only two matte eye shades included inside Naked 2. The question is – if you already own Naked, should you also purchase Naked 2? Well, it’s up to you – however – if you’re a neutral-junkie, then snag the Naked 2 Palette as soon as you can get your hands on it. We’re convinced it’ll be a hot seller and will sell out as soon as it hits stores! « New! 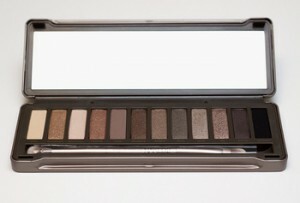 Urban Decay’s Naked 2 Palette	» Beauty Gifts For The Holidays!